This was our fourth pub of the morning on Saturday and our third Wetherspoons. 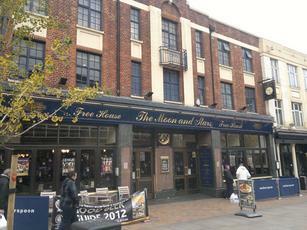 It's a typical branch and located on Romford's main shopping street, a stones throw from the station. There are tables and chairs out the front from which you can watch the shoppers go by. There were no real ciders on offer here. But the ale selection was good enough - Ruddles Best, Arundel Black Stallion, Brains SA, Everards Tiger, Sixpoint Make It Rain, Lancaster Red, Greene King Abbot & Adnams Broadside. The Black Stallion was perfectly palateable. Another tired looking Weatherspoons, its on the smaller side and the locals are old cockney codgers who seem to do alot of complaining and swearing, not my type of place, their a whole lot better Weatherspoons about, cheap and ok for a couple of halfs, come evening and door staff control this place as the old boys still want to prove themselves to be hard nuts. 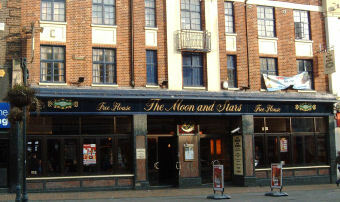 was once a nice pub, in the same way that one time i would have had intercorse with jordan. A not up the usual standards Wetherspoons pub!!! Food ok, beer cheap, locals scary. There were two fights outside when I was there and this was a Friday afternoon. Oh, and another guy there had a heart attack. Not a good vibe.